It’s 10.00am on a sunny October morning and the fruity scents of fermenting yeast, rising loaves rise up to greet us as we open the doors to E5 Bakehouse’s bakery under the arches of London Fields. Nine women have already begun to gather around the big wooden table, piled high with crusty loaves, butter, jam, sharing stories about their journey here from as far as Hounslow, Goodmayes and Woolwich, and about what baking means or could mean to them. 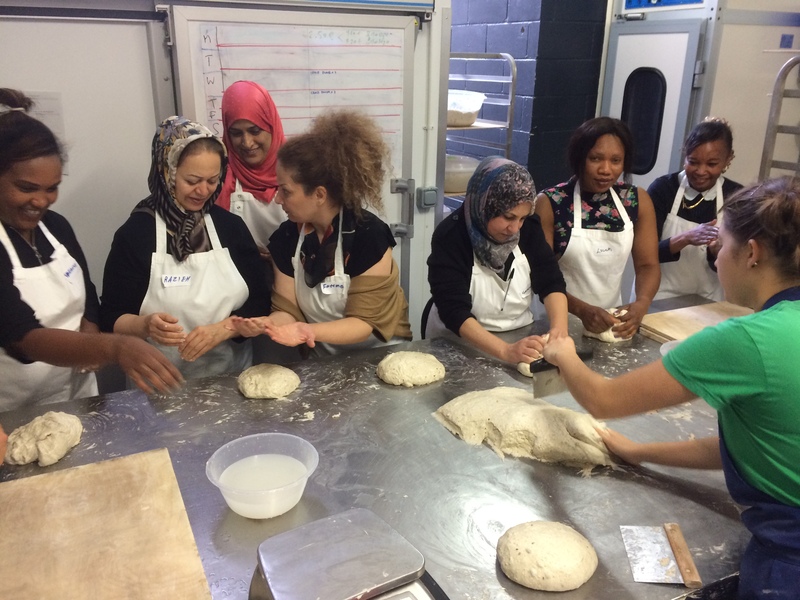 We are here for the first day of the Just Bread course, a 10 week bread-making project bringing together migrant women to learn, share knowledge and make plans for the future and there is lots to talk about. Thanks again to everyone at Creating for Good for their fundraising support. Over cups of coffee, passing round the bread between us, we talk about byrek, Albanian bread stuffed with spinach and cheese, injera in Ethiopia, which is sourdough risen like the E5 loaves, and fried pastries from Uganda. The cultivation of wheat, a practice which travelled from the East to the West, was a milestone in farming history, marking the end of hunter-gatherer societies and the start of settlements focused on planting crops and raising animals for food. It’s an ancient story. At the baker’s table, aprons on, head baker Luke introduces us to the sourdough starter, likening the bowl of bubbling organic flour and water to a wild bacteria warzone. Here, the bacteria which could be harmful are suppressed and the valuable strains thrive and are nurtured by the baker. We all jot down our notes in at least six different languages, sharing translations with each other. The starter needs ‘feeding’ like a family does, with more water and flour, and it’s at its healthiest when its bubbly and smells sweetly sour. Yeast and bacteria are extremely resilient and even after a few weeks of neglect it can be coaxed back into life. 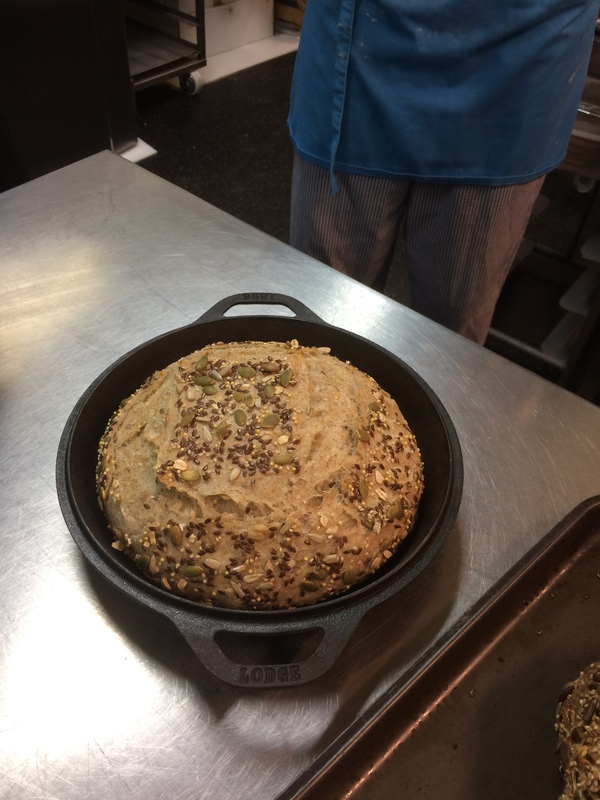 We all shape our own loaves, stretching and folding the dough, and transferring them to proving baskets to take home and bake in our own ovens. 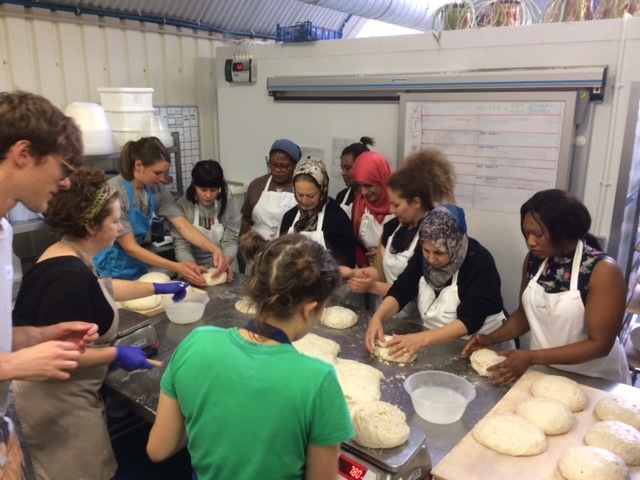 While we wait for Luke’s test loaves to bake, we observe the in-house flour mill in action – it’s a process many of the women have witnessed in other countries but never in the UK – and join the bakers preparing hundreds of sourdough loaves for the café, helping to shape and flour the dough. It comes easily to the team and within minutes our production line has whipped all the doughy orbs onto their baking trays. Baker Lizzie hands around some buckwheat for us to crunch our teeth on. This is an addition to the multigrain loaf here. She makes a note of the name for Seferina who wants to find the name in her first language. When Luke finally pulls his loaves out of the oven, we see what we are aiming for. Each loaf will be subtly or significantly different. Some airier, some fruitier, some flatter and denser, carrying the story of the precise and careful way it was cared for. We make our way home, our fluffy dough domes wrapped in blankets in their baskets, and a tub of baby starter in hand, and think about next week when we will share how we baked our own bread, how it tasted and where we want to take this knowledge. This is only the beginning.